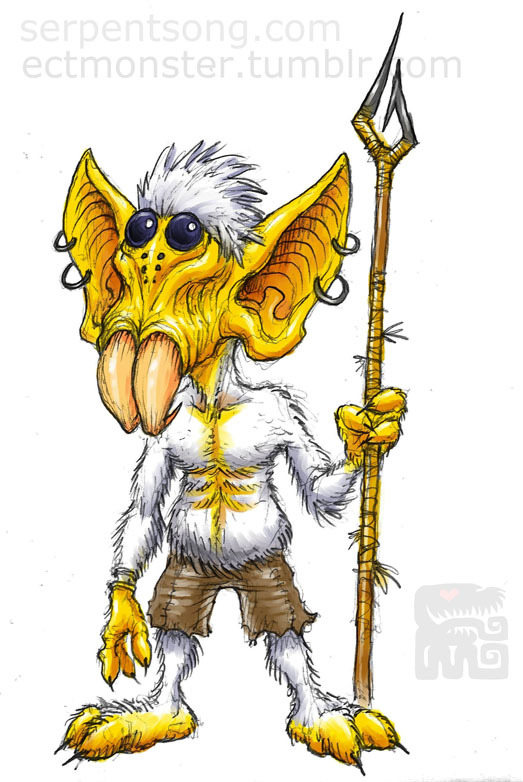 The Umgoy, commonly known by other races as “Nightfolk”, are nocturnal creatures that combine the features of bats and spiders, originating in the northern corners of Samshara. Male Umgoy are just over one meter in height, making them the smallest of all Samshara’s races. 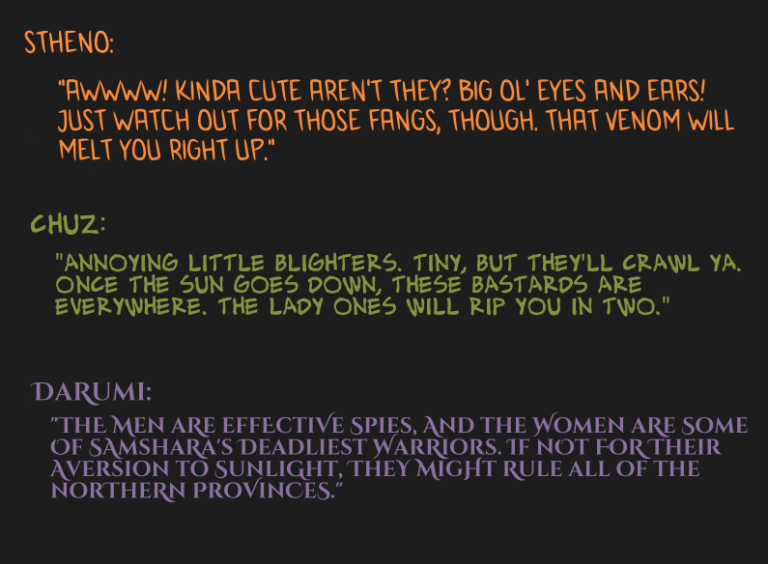 By contrast, the females are gigantic, some even towering over the massive Tuhaakh. Their highly developed ears give them a remarkable sense of hearing, and though their eyesight is keen in the dark, they have difficulty seeing in bright light. While some can spend years acclimating to life in daylight, almost all Umgoy come out only after sundown. Even those who can manage to move about in the day suffer from discomfort and impaired senses. Like spiders, Umgoy have large fangs that can inject a deadly venom into their prey, dissolving it from the inside. They are unable to digest solid foods, and most even have an aversion eating prey that has been dissolved by a venom besides their own. Umgoy males are quick and nimble, often finding work as scouts or guides through the wilderness. The female’s enormous size makes them well suited as warriors, guards, or for heavy manual labor. Umgoy’s thick fur makes them much more tolerant of cold climates than most races in Samshara. “Brighteye”: an Umgoy that has fully adapted to daylight. “Passion Feast”: an act of consensual ritualistic cannibalism, wherein the female devours the male after mating.